Fl Cap. 1 (1860) 301. Geophyte with subterranean branch system consisting of a series of interconnected spherical or oblong tubers up to 80 mm long and 20 mm in diameter, deciduous during the summer months. Prostrate on surface on the ground, simple, semisucculent. Lamina reniform to cordate, apex rounde, margin almost entire or shallowly crenate, (10-)15-20 x (12-)15-20 mm, microscopically sparsely adpressed pilose on both sides, with no glandular hairs, petiole 10-35 mm long, stipules triangular, 1 x 1 mm, membraneous. Inflorescence branch ramified, with smaller foliar leaves, peduncles 10-25(-40) mm long, bearing 3-4(-8) flowered pseudo-umbels. 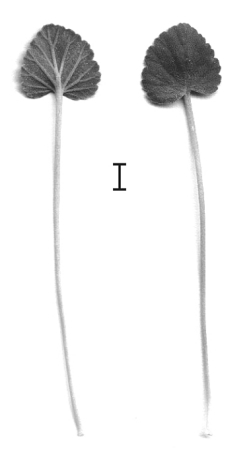 Ovate, concave, with acute apices. Hypanthium 10-15 mm. 5, white or very light purple, almost equal in size, apices retuse or rounded, posterior two 9-12 x 4-8 mm, sharply reflexed at >90 deg, with red markings. Anterior three 8-12 x 4-9 mm, with or without markings, reflexed at <90 deg. 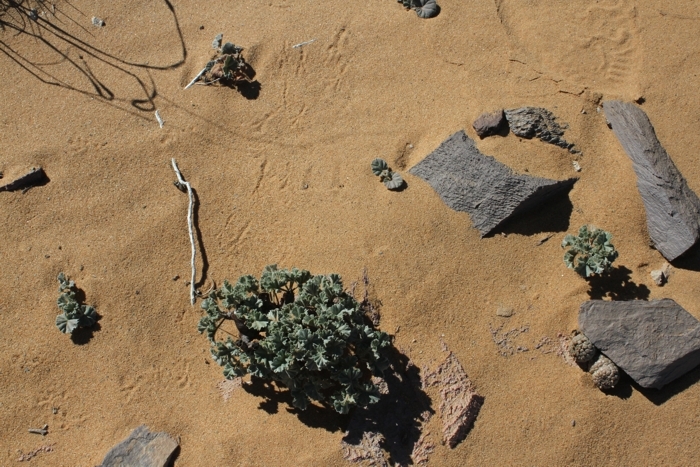 The outlandish dune landscape along Orange river 10 km E Alexander Bay, N Cape Province. Seemingly inhospitable but abound with the most interesting xerophytes adapted to constant scorching sun, less so to pollution from mining company vehicles whizzing by this wondrous landscape. 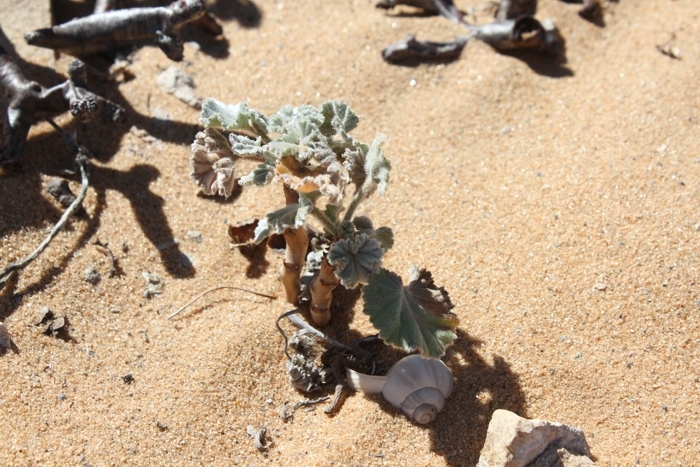 Despite dryness, there is humidity deep in the sand with many plants having underground tubers. The water-conserving nooks and crannies in south-facing rocks are all inhabited. 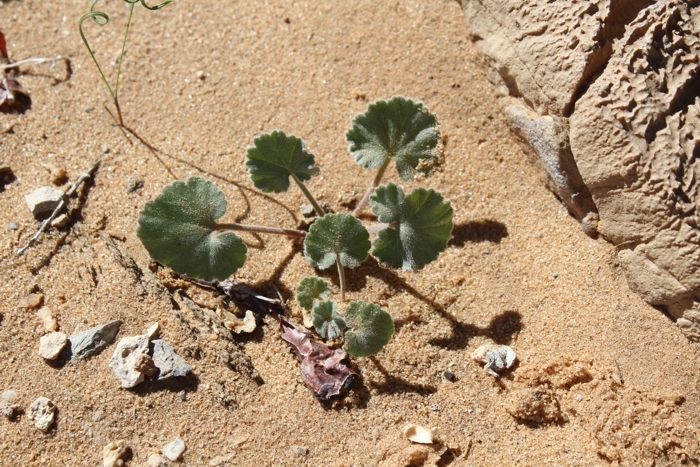 An unusually long-stemmed P. sibthorpiifolium, 10 km E of Alexander Bay, perhaps the stem was uncovered due to sand movement. A somewhat confusing planting scheme at the above location: two P. crassicaule and four P. sibthorpifolium in an area no more than 1 m2. The young plants are difficult to tell apart as their leaf shape is confusingly similar. P. crassicaule develops dark brown stems with age which make the adults distinct, however, both have numerous tubers underground. 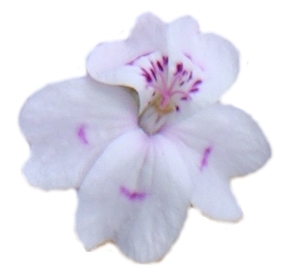 P. klinghardtense and P. albersii are also common here. Note the Larryleachia sp. in the lower right corner, marvellously adapted to the extreme growing conditions. 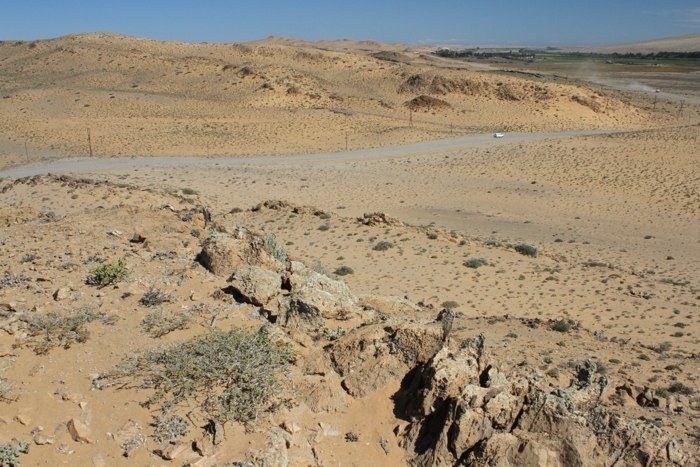 Sarcocaulon multifidum, the ultimate desert survivor with small densely hairy leaves extracting moisture from morning mists rolling in from the cold Atlantic, and long tuberous roots: there is more of the plant underground than above. 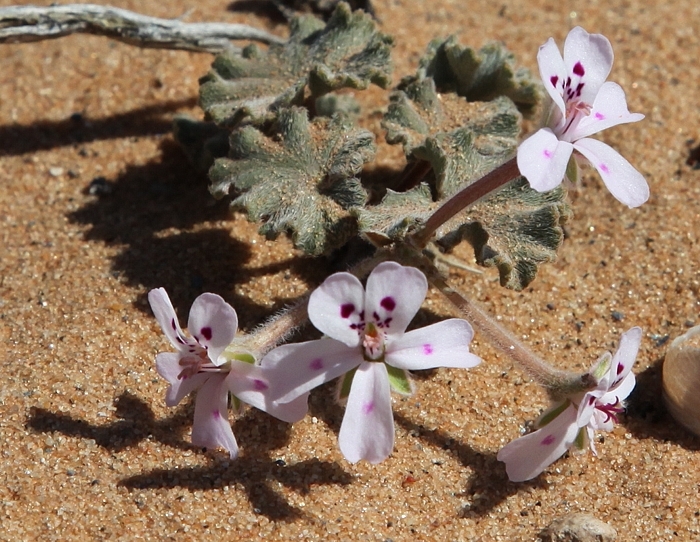 It grows in slightly elevated areas, alongside dense populations of P. sibthorpiifolium. 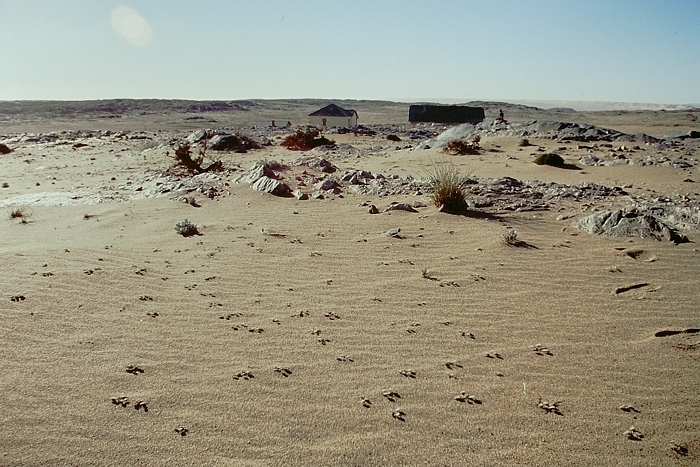 The dunes above Kolmanskop in S Namibia, not far from Lüderitz with a large colony of P. sibthorpiifolium. The plants are so abundant here and their tubers so deep (starting at 30 cm) that one wonders whether this is not all one and the same plant with an extensive root system! Kolmanskop is well worth an extended visit: the abandoned but once wealthy Art Deco mining town imported ice and whole opera productions from Europe. How fortunes change.